Derek Gallanosa, Abnormal Beer Co. head brewer. Welcome to a tale of two local craft brewing companies, one large and in charge of Escondido and the other smaller, but trying harder at Rancho Bernardo. We’re talking Abnormal Beer and Stone Brewing on today’s edition of Wide World of Foam. Rancho Bernardo craft brewer Abnormal Beer Co. may have opened only 15 months ago, but has grown enough to make it at The San Diego County Fair. Its brand-new signature brew, California Commons, came out this month, and is being served around the Del Mar Fairgrounds. Ground Zero for beer tasting purposes is the Steampunk Ale Pavilion at the San Diego International Beer Festival. 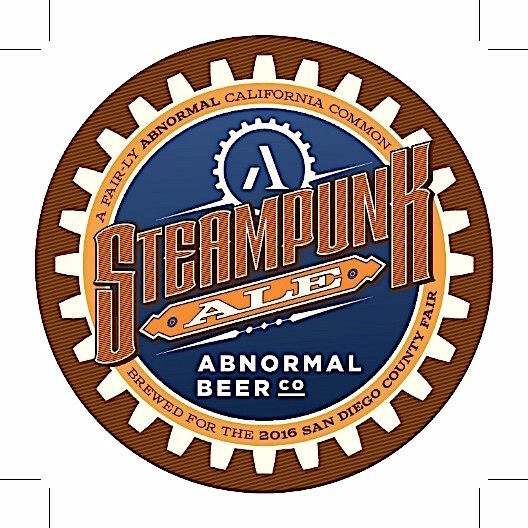 More fun facts about Steampunk Ale and Abnormal Beer Co.
o Bronze medal for Year One IIPA, Imperial IPA Competition at the SD International Beer Festival 2016. 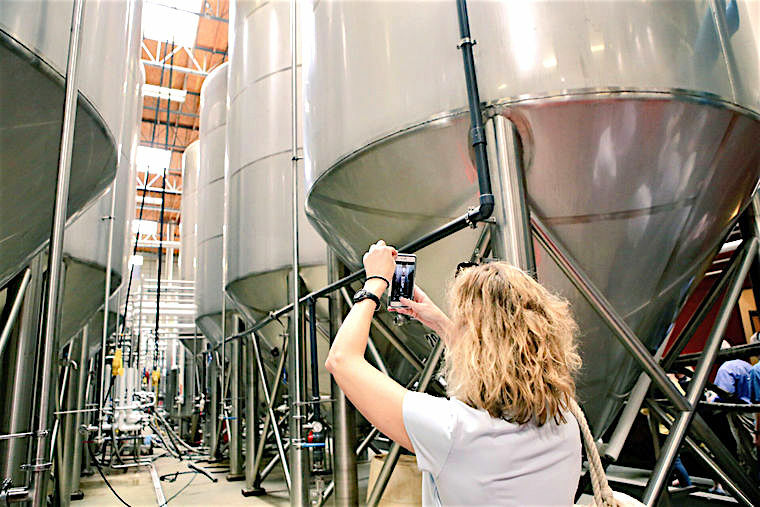 Cyane Crump, the director of Historic Richmond, photographed beer tanks at Stone Brewing’s headquarters at Escondido on Thursday, April 21, 2016. Crump was on ChamberRVA’s InterCity visit. Stone Brewing continued this month with its ambitious expansion, announcing Napa and Richmond expansion plans. The Escondido craft brewing legend announced plans to expand its taproom footprint in California, adding a 10,000 sq. ft. pilot brewery and tasting room in downtown Napa. The taproom is slated to open in 2017 and will accompany two other Stone Brewing expansion projects in Richmond, N.C. and Berlin, Germany, which will be operational this summer, the company said. Stone officials said the company soon would begin renovations on the 139-year-old Borreo building, which at one time was home to the grain and feed department of grocer Thompson Beard and Sons. The company plans to install a 10-barrel pilot brew system, which will be used to produce unique small-batch creations and will complement the company’s core beer lineup. “We recognize the high quality of wine that comes from the region and the appreciation that Napa Valley locals and visitors have for fresh, well-crafted drink. We are elated to become a contributing part of such an artisanal town,” Koch added. As for Richmond, the excitement was palpable as Stone leaders briefed the locals about what was about to go down in their fair city. Steve Wagner, one of Stone’s co-founder; Pat Tiernan, Stone’s chief operating officer; and Steve Robbins, Stone Bistro’s director of hospitality, recently met with a group from central Virginia with the Richmond ChamberRVA InterCity who came to Escondido to see the flagship efforts here. Plans to open what it has been described as a “destination restaurant” are several years off, but Stone’s Richmond brewery already is open, and beer brewed in the facility is expected to be ready for sale by midsummer, Tiernan, said. The chamber group toured the Escondido facility, which a guide noted actually is significantly smaller than the facility the company is building in Richmond. After the tour, the group drank Stone beers in a lush garden patio outside the bistro while discussing the operation with the company’s leaders. Before the midsummer date, the company will have to run several pilot batches of beer through their new system that won’t be salable, Tiernan said. “If you want to drink it, send me an email; we’ll put some taps outside the window,” he said. Wagner said Richmond’s beer scene already is thriving. He said the city should expect that trend to continue — aided, of course, by Stone. “I think it’s encouraging more guys to set up shop,” he said. Be the first to comment on "Wide World of Foam: Abnormal and Stone"